Announcement The shop is sold out! Next shop update will be in the summer. The shop is sold out! Next shop update will be in the summer. Beautiful and whimsical illustrations that remind me of my childhood. 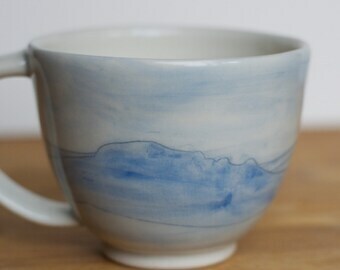 Thes smeared ink look makes it look unique and love the cloud inside the mug. What a fun touch. 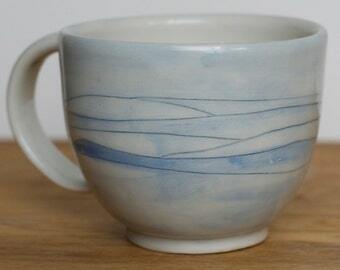 Love the blue glaze on the mug. Well crafted mug that is comfortable to hold. I always love seeing photos of my work out in the world, but when they look like this I'm on cloud nine! ️ Thanks so much for the gorgeous photo Claire! Handcrafted ceramics made in the Blue Ridge Mountains. The use of functional ceramics incorporates daily visual and habitual elements within our lives. They can be objects of festivity and beauty, or vessels for nourishment. Utilitarian pottery is an intrinsic part of social relationships and rituals that are created over a shared meal. These objects compose a conversation that both enriches and celebrates life and what sustains us. My work intends to elevate daily practices into lighthearted and joyful experiences that convey a sense of place. I am captivated by the concepts of home and belonging. Within my work I explore these concepts through narrative and whimsy. I draw storylines on functional work to elicit the feeling of home or place, usually focusing around my childhood spent in the Blue Ridge Mountains. Pitching a tent in the woods is a simple act, but it is one that denotes presence and the creation of your own home. This imagery manifests the playful, the magical and the whimsical that exists within reality and in our imaginations. It wasn’t until beginning university that Laurie settled on a medium : clay. Four years later, she received her Bachelor of Fine Arts Degree in Studio Art with an emphasis in ceramics from Appalachian State University in May 2014. Laurie currently resides in North Carolina where she manages a pottery studio + creates her own work. Within her media, Laurie employs a variety of techniques including throwing on the wheel + hand building. Laurie's work explores the significance of belonging + everyday (and extraordinary) magic. My intention for my work is for it to elevate daily practices into a playful + joyful experience. My drawings explore a sense of belonging, the playful, the magical + the whimsical that exists in reality or in our imaginations. Each piece of handmade pottery is meant to be used and loved every day as well as being a piece of art for display. The handmade pottery may be put in the dishwasher, oven, and microwave. However, pottery is breakable and should be protected from obvious shocks like dropping it and from sudden changes in temperature. Uneven heating can cause it to crack. Items with gold accents are not dishwasher or microwave safe. Any item will comply roughly with the sized specified in the listing. However, due to the handmade nature of my work the sizes and shapes vary slightly from item to item. Don't hesitate to contact me for customized and personalized items. Please allow 1-3 months for custom work.